Curious how many of you use a forward press before taking the club back. Not talking about putting, but full shots, half shots, and pitching / chipping. I've been working on playing the ball a bit further up in my stance (it was creeping back and leading to hooks). When I hit it bad my hands drop at the top, I have a bit of a strong grip, path is open and face is closed - and every once in a while it can get ugly. Not only that but when I pitch or chip the same miss can happen and it's just a shot off the toe with not enough spin or distance control. Head on view, my hands are at most even with the ball or more times than not slightly behind at address. I started using a forward press and started striking the ball really well from 100 yards and in. I haven't gotten to mess around with it through the bag but like how it felt. I guess a follow up question(s) for those of you who do forward press - do you do it throughout the bag? Are there any shots where you consciously wouldn't do it, like maybe a bunker or flop shot where you need to keep the face wide open? I tore my TFCC in my left wrist (so have mobility problems) so the only way I can get a flat wrist at the top is to forward press before taking it back. I do it for every shot except putts, chips, greenside bunker, and flop shots. I guess a follow up question(s) for those of you who do forward press - do you do it throughout the bag? Are there any shots where you consciously wouldn't do it, like maybe a bunker or flop shot where you need to keep the face wide open? I should have mentioned this in my progress thread, but I've started to do it ever so slightly in my pitching and chipping. My routine is a couple of rehearsal swings only looking at the hole, set up to the ball, focus on the ball, tiny forward press then Go! Ok I'll bump my own thread. I'm not too proud. So I played nine and hit a bunch of balls tonight. The forward press, as it relates to my swing, seems to only be effective from chipping around the green to pitching up to about 120-130 out. 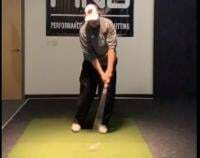 Basically the shots where I play my stance open a bit the press really seems to improve my contact. With a driver and longer clubs I hit some pretty wild shots. Almost like it kind of throws off my rhythm on full shots with a square setup. Mostly hooks or when I tried to cut it the dreaded block / cut.